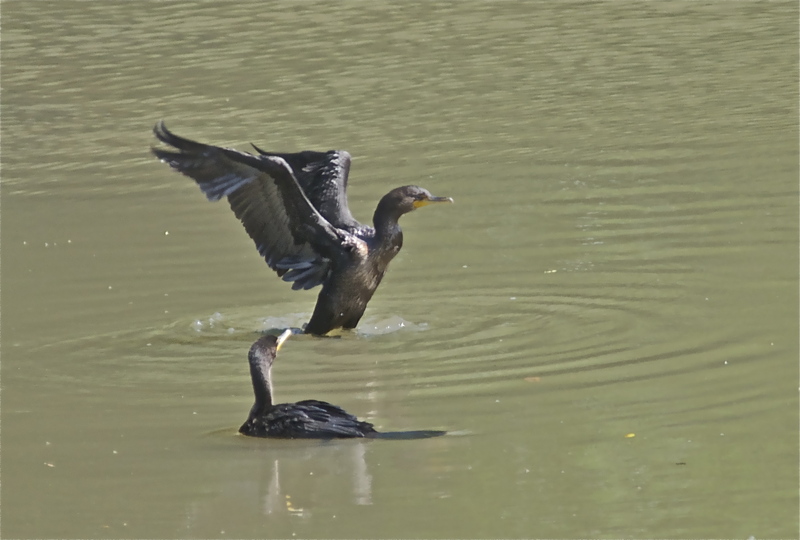 I was surprised and somewhat concerned to see a pair of Cormorants on the pond. The majority of the waterfowl on the pond are dabblers, meaning that they feed on the surface by dipping their heads into the water. Cormorants are divers that feed by diving under the water and are much less vocal than are dabblers. Their legs are set far back on their bodies to facilitate their diving. I was concerned about the Cormorants because of their legs. Though an asset for diving, the placement of the legs makes it necessary for a long runway for them to gain sufficient momentum to lift off–the pond covers only 5 acres. They’re very awkward on land, some divers to the extent that they’re nearly helpless. The visitors were gone the next day, so evidently they’d negotiated a safe take off. Cormorants’ feathers lack the protective oils other birds’ feathers have, so they often sit in the sun with their wings spread to dry them out. The bird in the photo is neither landing nor taking off; he’s spreading and flapping his wings to shake off water from his recent dive. Like Great Blue Herons and Wood Ducks, Cormorants nest in trees. This entry was posted in Mentor Ohio, Nature, Santoli Pond and tagged cormorants, cormorants' feathers lack oils, dabblers, divers, double-crested cormorants, great blue herons, nest in trees, ring-necked Ducks, Santoli Pond, scaups, waterfowl, wood ducks. Bookmark the permalink.